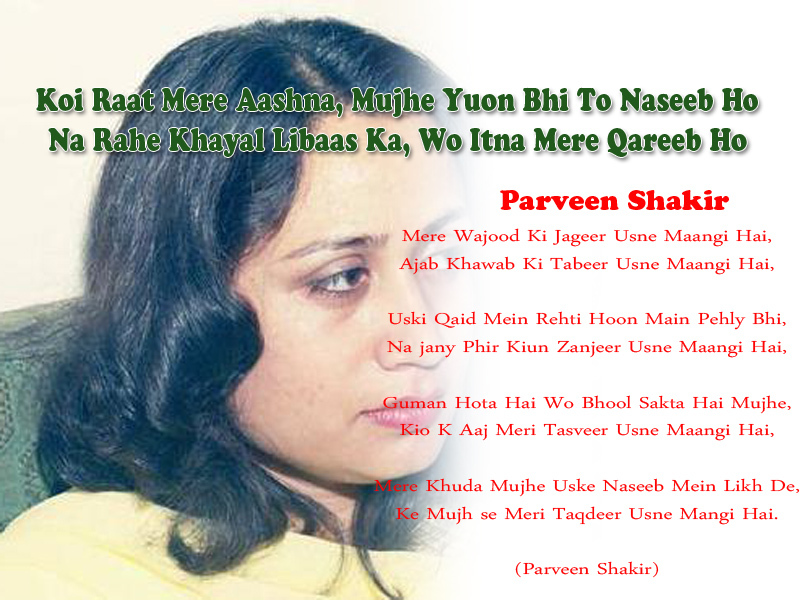 Parveen Shakir is famous female Urdu poet, teacher and a civil servant of the Government of Pakistan. She born on 24 November 1952 in Karachi Sindh Pakistan. Shakir’s 1st book “Khushbu” was presented the Adamjee Award. She was also awarded the Pride of Performance, one of Pakistan’s highest honors. Parveen afterwards brought out other Urdu volumes of poetry and received – Sad-barg [Marsh Marigold] in 1980, Khud Kalami [Soliloquy] and Inkar [Denial] in 1990, Kaf e Aina [The Mirror’s Edge] besides a collection of her newspaper columns, titled Gosha-e-Chashm [The Sight Corner]. the Pride of Performance for her outstanding contribution to Urdu literature. The poetry books are collected in the volume Mah e Tamam with the exception of Kaf e Aina. You can send Parveen Shakir Romantic Poetry In Urdu Collection Free Downlaod For Facebook. Here we are sharing Beautiful Parveen Shakir Poetry in Urdu SMS Ghazal to share with lovers on facebook and whatsapp. Dil Ko Khushi Ke Saath Saath, Hota Raha Malal Bhi. Chaand Bhi Aain Cheet Ka Is Pay Tera Jamaal Bhi. Ek Dafa To Ruk Gayi Gardish-E-Mah O Saal Bhi. Mouj-E-Hawa-E-Ko-E-Yaar Kuch To Mera Khayal Bhi. Ke Mujh se Meri Taqdeer Usne Mangi Hai.